Young lovers brings two fighting clans together. The town's leading citizen becomes a homicidal maniac after his wife deserts him. The saga of a battalion of U.S. Marines during the Korean War, starting with their training, landing at Inchon in 1950, advance into North Korea and their subsequent retreat back to the 38th parallel. The story of a singer in a minstrel show, from his career highs to the tragedies in his personal life. The family and friends of two children lost in the wilderness mount a desperate search to find them. Sheriff Halliday doesn't approve of his children dating or marrying half-breeds and his blind hate threatens to alienate his whole family. A MYSTERY KILLER STRIKES... and a beautiful blonde pays the penalty for knowing too much... Was she a modern Mata Hari? The plot development of this film is very serviceable -- everything is laid out a half reel to a reel before you need to remember who said what -- and there are no cheats, no "bzzz-bzzz" whispered bits to cover plot holes. It all develops very naturally, with a rather outstanding cast of character actors livening up the proceedings. Ben Alexander is one of my favourite gentle actors, and he wowed me here. Dudley Dickerson and Bernice Pilot are enjoyable as comedic servants with a central role in moving the plot forward on several occasions. I. Standofrd Jolley is at his handsomest and most sinister -- a great non-Western role for this versatile villain. Ann Doran is nice too. Oh, and Boyd Irwin is so British as an American colonel -- quite splendid -- and kudos too to the prolific Robert Frazier, always good looking in uniform, and an intriguing actor. The print i saw was remarkably clear and crisp, with good sound quality, something worth mentioning in a PRC picture. The end of the film comes very suddenly -- one wonders if some footage is missing -- and there is no musical score to heighten the drama of some otherwise very tense scenes. In fact, i think that had this film been scored, film critics who like Joseph Lewis' "Gun Crazy" (and who doesn't?) would compare this movie much more favourably to that film noir cult classic than they have. 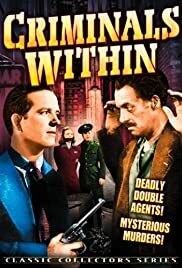 The scenes in which people move from room to room, doors locking and opening behind them, menace just out of sight, are exemplary film-making, but seem dulled a bit due to the complete lack of a score. Well, i may be in the minority, but i liked this film a lot. I wonder why it was held two years, lacks a proper ending (by which i mean the extra two to three minutes of wrap-up dialogue one would expect), and was released with no score.... Something odd about that. Anyway, It is well worth a look.